, European odyssey, A few weeks after we bought our new camper van we finally set off on our first “food odyssey”. I had been packing the van with essential kit over a number of days, including bedding, pots, tableware and some fruit and vegetables, so that we’d be ready to go at a moment’s notice. On Saturday morning we awoke to see a bizarre mist over the hill in front of the house and took this as a sign that the weather would be glorious, so we decided that today was the day. We grabbed a few final items, raided the fridge and hit the road. My dad had let us know that there was a food festival on in Dungarvan, so we decided to head there in search of a delicious lunch. As is typical in Ireland, we had only travelled a few miles before the heavens opened. We hoped it would clear by the time we reached Dungarvan, which is about an hour and a half from home. When we finally reached Dungarvan the rain had indeed stopped, but it was still very wild and windy. We were disappointed to find that there was no food market on the Saturday of the festival – that wouldn’t be set up until Sunday. We browsed the schedule for Saturday afternoon and I found a talk by John and Sally McKenna that I thought sounded very interesting, so we booked a place at that. It wasn’t due to start until 5.30pm, so we still had plenty of time for lunch. By this time we were both starving and tempers were starting to fray, so we did very little in the way of reconnoitre to find a suitable eatery. 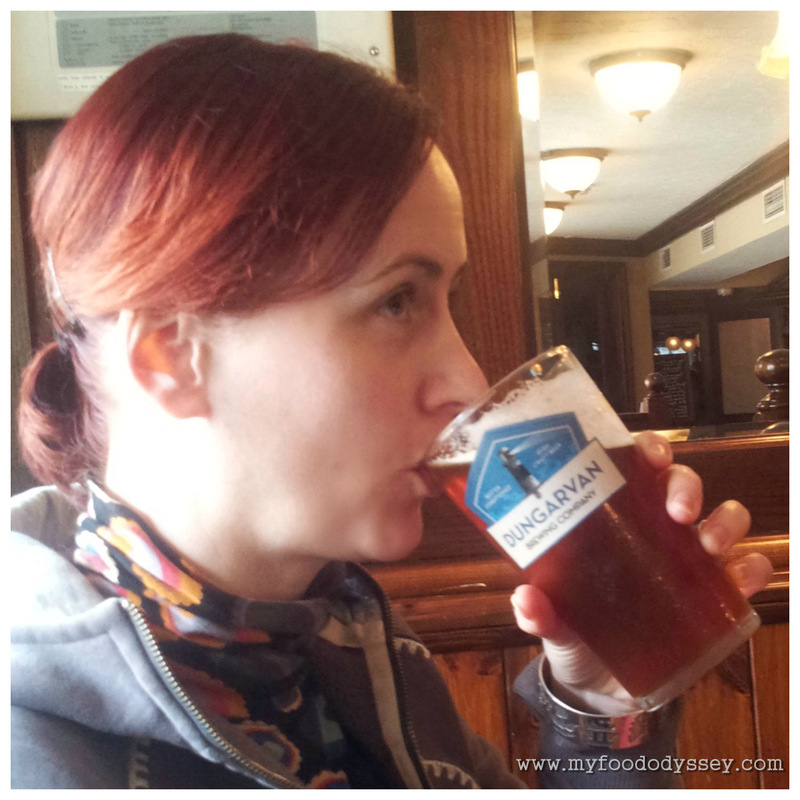 We spotted a pub that looked both cosy and bustling and decided to give it a go. It turned out that this particular pub, Merry’s, was an award-winning gastro pub. The menu indicated that the food was all freshly prepared and so would take some time, but that it was worth the wait. They were right on both counts. To sooth the nerves while we waited I ordered a pint of a local beer, Copper Coast from Dungarvan Brewing Company. I was fascinated by the way it was pumped by hand, like a French pression beer. The beer itself was delicious and hit the spot nicely. Our orders of ribs and a burger, which both came with hand-cut fries, were devoured in minutes and with little conversation. After lunch we headed down to the talk, “The job of being a food writer”, with John and Sally McKenna. John and Sally have been writing guides to Ireland’s best restaurants and hotels for over 20 years and are highly regarded food writers. The talk featured some of the finest food writing from a wide variety of writers. I was fascinated for the full hour, even if my husband was a little fidgety. As the talk finished early leaving a long evening in front of us, we decided to head further afield. We landed in Youghal at about 8pm and decided to have dinner and settle there for the night. We found a glorious spot to park right in the harbour, where we could listen to the waves lapping against the harbour wall. Feeling it was appropriate, we had fish and chips straight from the paper while looking out over the sea. After a “glass” of wine (we had no glasses, so drank from cheap plastic cups! ), we settled down for our first night’s sleep in the van. It was both warm and comfortable and we both slept soundly. 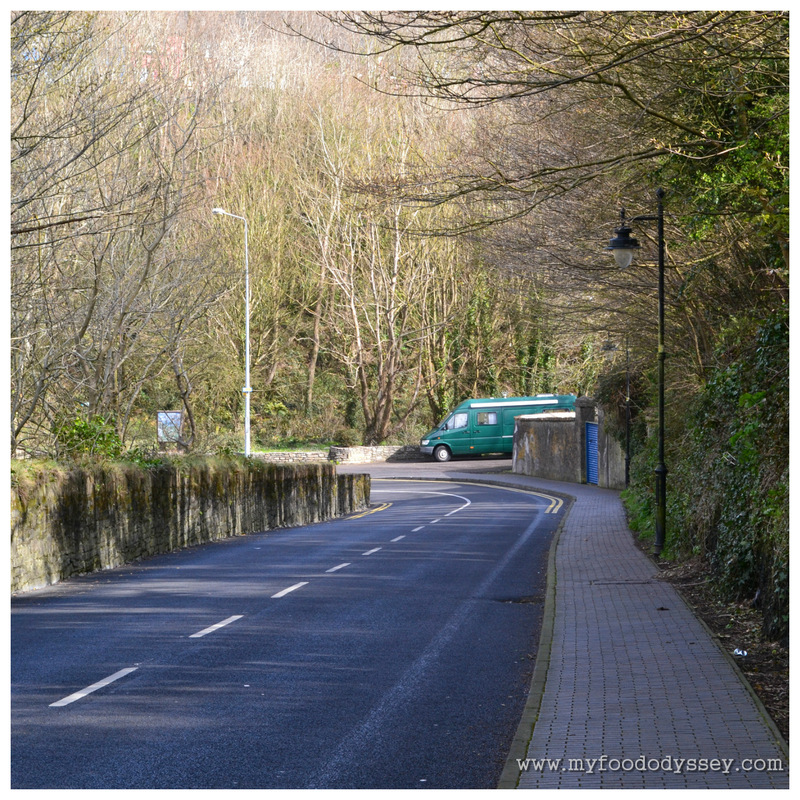 The next day we headed back to Dungarvan for the food market. There was a vast selection of mouth-watering products, both ready-to-eat and products to bring home. It was great to talk to the producers directly and taste their delicious wares. My only issue was that, as we only had two weeks left before we departed, I didn’t really need any more food – I was finding it difficult to use up all our stocks as it was. I bought a Rocky Road (which was to die for!) and a bag of wild garlic, and we headed off again. 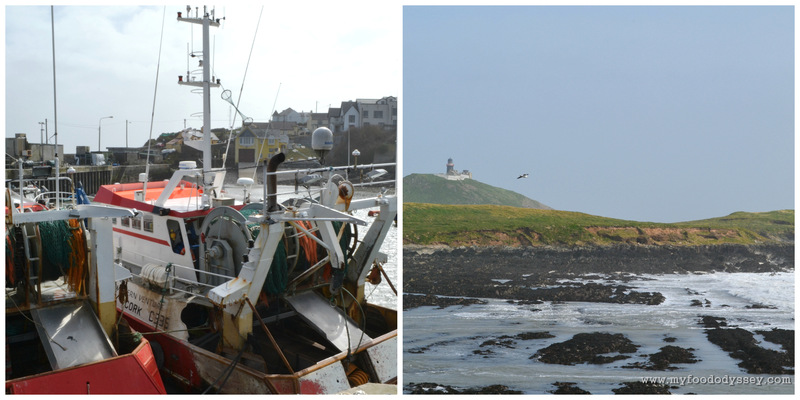 Ballycotton fishing harbour and lighthouse. Based on the rocks and waves that we saw, the lighthouse is definitely needed. We headed back towards Cork with no particular plan. After a time we spotted a sign for Ballycotton, which I had heard about a few times on cookery programmes. Ballycotton is a small fishing village in south-east Cork. When we arrived the sun was shining but the wind was crazy, so we stayed in the van. A few people attempted to walk on the cliff, but most arrived back to their cars only minutes later looking both disheveled and dejected. The harbour itself was calm but the sea-shore to the east of the harbour was wild, with huge waves crashing over the rocks. The presence of the waves and a nearby lighthouse reminded me of the risks fishermen take to bring us fish to eat. Today was Sunday, so the boats were all safely in the harbour, but come tomorrow these guys would be out fishing again, regardless of the weather. From Ballycotton we headed further west towards Cork city. After a cranky 30 minutes driving aimlessly around the city looking for someplace to park our enormous van we decided to head back out of town, and randomly picked Douglas. There we found a supermarket where we picked up a few extra provisions for dinner. It was almost 7pm on a Sunday evening and the store was reducing the price of perishable items for a quick sale. We managed to get some prawns and a beautiful rack of lamb at seriously marked-down prices. As quickly as we could, we found a quiet, off-road spot to park the van while we cooked dinner. The meal was simple – fried prawns and mackerel with boiled potatoes and a salad made with the wild garlic I’d bought earlier. 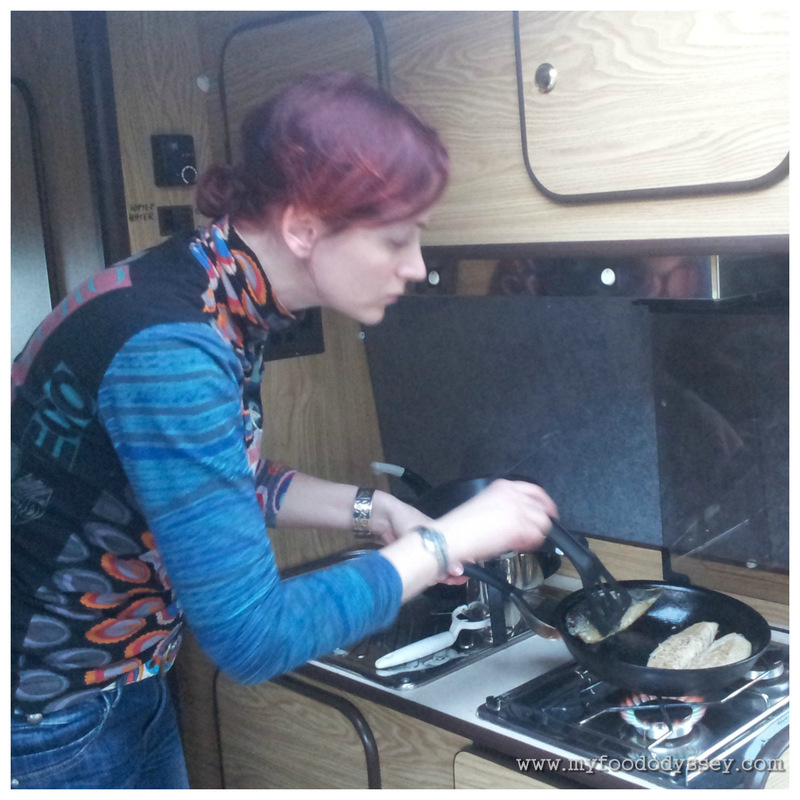 Any apprehensions I’d had about cooking in the confines of the van vanished quickly – it was no problem at all. I’m not sure if it was the food itself, the fact that we’d had lots of fresh air or our stunning surroundings, but it was one of the tastiest meals I’ve had in a long time. By this time we were anxious to find somewhere to park the van for the night. We had been to Kinsale previously and thought it would be suitable. It was only about 30 minutes away, so we headed there. We found a perfect, discrete spot under some trees towards the back of the harbour. The green colour of the van is great for blending in! We had a perfect night’s sleep with no disturbances. 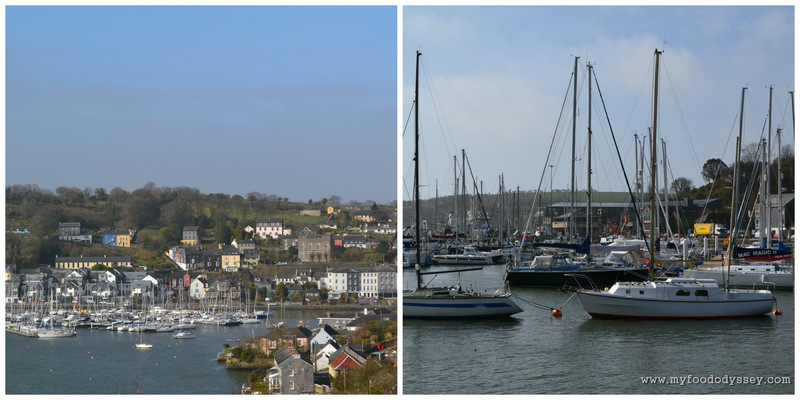 When we awoke the next morning we went for a walk up Kinsale hill, which has beautiful views back over the harbour and out to sea. After a quick breakfast we hit the road again and headed for home. On the way home we visited Bandon Cattle Mart. We arrived home late in the evening, exhausted but excited by how well the trip had gone and the prospect of many more trips to come. Sounds like you both had a wonderful first adventure in the camper van – and nowhere better than the beautiful town of Dungarvan! Keep posting regularly, it’s making great reading! And all the best in your foodie adventures!